SINGAPORE - Convicted murderer Jabing Kho, 32, was executed on Friday (May 20) afternoon, hours after a five-judge appeal court denied his latest bid to escape the gallows. The Singapore Police Force said in a statement that Kho "had his death sentence carried out on May 20, 2016, at Changi Prison Complex" and that he had been accorded full due process under the law. This brought to a close a long-running case in which Kho appeared before the apex court twice in the past two days, even though the court had already said in April that the matter should come to an end. 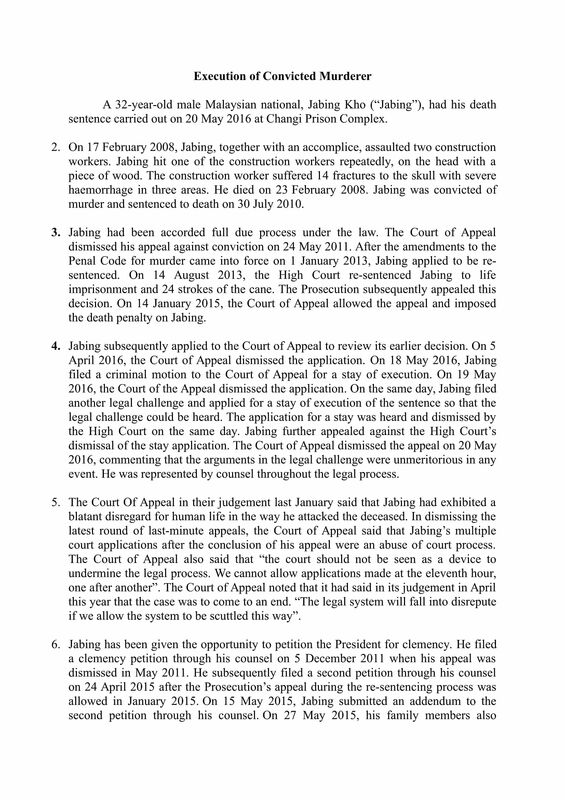 In 2008, the Sarawakian brutally killed a construction worker while robbing him. The victim, Chinese national Cao Ruyin, was bludgeoned on the head with a tree branch. He suffered a shattered skull from multiple fractures and died six days later. Kho was originally scheduled to be hanged on Friday morning. But two days before, lawyer Gino Hardial Singh filed a criminal motion to quash the death sentence. This was rejected on Thursday afternoon. Separately, on Thursday, lawyer and opposition politician Jeannette Chong-Aruldoss filed a civil application in the High Court. She sought a stay of execution but was rejected. However, she was allowed to file an appeal if she met an 11pm deadline. She managed to do so, and Kho got a reprieve. On Friday morning, the apex court heard arguments from Mrs Chong-Aruldoss as well as another lawyer, Mr Alfred Dodwell, who had also filed a civil application against Kho's death sentence. He later withdrew it. When the lawyers sought an adjournment, saying that they were not prepared to argue, they were chided by the court, which also dismissed the application. "This case has been about many things. But today, it is about the abuse of the process of the court," said Judge of Appeal Chao Hick Tin. Kho's lawyers were presenting arguments that had already been made earlier. If allowed, this would throw the whole system of justice into disrepute, said the court.